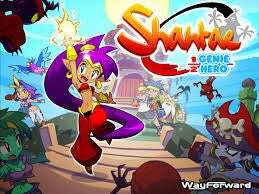 Half Genie Hero is the latest game in the Shantae series, and the first to be funded on Kickstarter back in October 2013. I wanted to back it on Kickstarter, but for some reason, I missed my chance when the campaign ended. So, I backed it on Paypal, and I went all in with the Early Access tier, because I wanted to play it ASAP. Fast forward to today: I’m just chilling at my desk, on my laptop watching a Youtube video, when I see I got an email from WayForward about my Early Access code! I dropped what I was doing and logged in. Turns out I never filled out my backer survey. I paused for a few minutes to decide on my platform of choice for the final game. I eventually decided on the Wii U, but I may change it later (PS4/3/Vita? Steam?). After filling my survey, I found my Steam code, and downloaded the demo! Now, the question you want answered: How’s the game? The demo is made of 3 stages, and according to WayForward, this is the same demo they will show at this year’s E3. First off, this game is GORGEOUS!! It took me back at first seeing Shantae and the environments look so smooth and vibrant. All the animations are pleasing to look at, especially Shantae’s dance transformations! Only 2 transformations were available (unless I missed some): the famous climbing monkey from previous games, and a crab who can swim underwater. The controls are very responsive, which is crucial for any platforming game. It felt great on my Dualshock 4, but it also supports a 360 controller, and old fashioned keyboard. The 3 stages are: a jungle/temple stage; a desert level w/ crazy wind and water sections; and one where Shantae is sliding down a column, and must avoid obstacles and make jumps to get to the end. There are secrets to find, as is tradition in platformers. There was a treasure chest locked behind a wall in the first stage, but I had no way to break through the wall. I assume this needed some other ability/transformation I didn’t have. In closing, what I played felt very much like what I’ve loved from the Shantae franchise so far. Hopefully, WayForward will have more to share at E3 next week, and maybe we’ll get the final game this year (maybe even sooner!). For a refresher on the game, here’s the trailer they shared back in 2013.